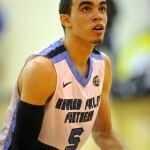 HAMPTON, VA -- One of the things you can depend on when watching Team Howard Pulley in action during the Nike EYBL circuit, is that point guard Tyus Jones is always going to show. I've covered the AAU circuit in person for about a decade now, and along the way there have been a few special players who always seem to have their team in the game and with whom you can feel confident that when the ball is in their hands at crunch time, good things will happen. The best prospect I have ever seen in this regard was former Duke PG Kyrie Irving, now an NBA stud. Irving, though, was special and that made you want to watch all of his games. Jones may [private] not be in Irving's elite class, but he's not far from it, for he has that gift of squeezing out the best from his teammates, even when they are not the most talented bunch. 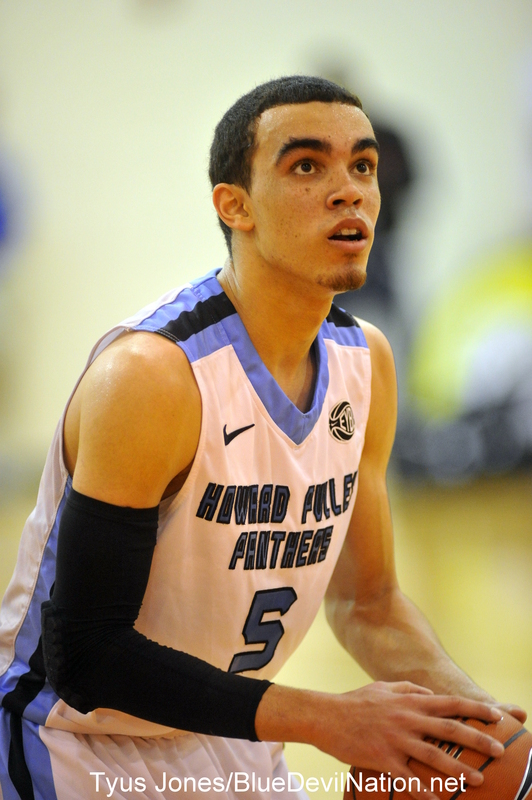 More so than ever this EYBL season, Jones has had that special presence. He wants the ball when the game is on the line. Whether it is scoring the ball, getting off a tough pass to a teammate, or finding a way to get to the line, Jones thinks on the fly with the best of them. And he demonstrated all of that this past weekend in Hampton. Another thing I noticed is that Jones is starting to get his opponents' best shot every time out, as players try to prove themselves against the best, in front of the various talent evaluators at these events, and boost their own rankings in the process. One such game where Jones stood out was a match-up against Wisconsin Elite and star guard Rashad Vaughn, a fellow Minnesota standout being recruited by the likes of UNC and others. The two went at it all game long in front of a bevy of America's best coaches, including Duke head man Mike Krzyzewski, who never missed a minute of any of Jones' games. In a close, high-scoring game, Jones once again took over down the stretch. It started on the defensive end with a key steal, leading to his drawing a foul which helped Howard Pulley tie the game. With a minute left in the game and the score tied, Jones wiggled free for a three-point dagger. A game Wisconsin Elite team answered, cutting the lead to 81-80, but Jones iced the game with another three-pointer, giving his team an 84-80 win in one of the session's better games. "Up and down, more of a motion offense and style," Jones stated post-game when asked what kind of team he wants to play for in college. It was easy to see from his performance that this is a kid who could man the controls with ease for a program like Duke. As you have seen in our other interviews, Jones is saying he wants to make a Fall decision, but if you are looking for a tip on where he is leaning, you are unlikely to get it from the many interviews he does. Jones is quick to crack a smile but he has a serious poker face as well. He knows how to navigate the unsteady waters of recruiting and the recruiting media just as effectively as he does a defense when he enters the lane. "In the college game, I just try to watch all the point guards and take bits and pieces from each one. In the NBA, I love watching Chris Paul and how he takes apart the game," said Jones post-game. It's no wonder why Krzyzewski has taken such a liking to Jones and wants to coach him, for he is a good Duke fit and a player the Blue Devils would like to grow even more. When asked what he would work on as the summer begins, Jones said, "Just overall speed and strength." Jones is a cool customer on the court, never out of control and an assist machine. In the past, it's amazed me how much he stuffs the stat sheet in that his smooth performances are not choppy in nature but almost like a silent, steady killer. In other words, you think he has 16 and 5 only to find out he has 28 points and 12 assists. He just blends in without being overly flashy like some players try to be in an effort to be noticed. I joked with Tyus, whose mom liked the name from having heard of former UCLA guard Tyus Edney, that he was like "Jack Frost" on the hardwood, cool and deadly. That earned a little smile for he is not the type to pound you with cocky assertions while being interviewed. "I'm just trying to make plays, that is what I am always trying to do. My teammates have been playing great this weekend, so I feel I owe it to them to make a play down the stretch and that's what I've tried to do the last two games," said Jones, always one to defer to his teammates after a win. Jones is a competitor. He just finds ways to help his team win. He's a young man well aware that not all the teams playing now will end up in a steamy Augusta, South Carolina come July for the Nike Peach Jam. If you get the opportunity to see Jones in person, look at the determination on his face as he drives a crowded lane and watch how he finds the best opportunity presented him, taking advantage of any little weakness by his defenders. "Definitely, definitely. Peach Jam is the ultimate goal, so every win you can get whether it's by one point or fifty points, each one is key," said Jones when I asked him of his drive and the importance he seemingly placed on every game. "Competitive game, overtime, it was a great game," I said to Jones. Jones agreed. "It was. It was a great game. Going back and forth all game long, there is nothing better than good competition, so it was fun." For more player interviews, join BDN Premium for full site access. You need a map and compass to keep up with the various appearances Mike Krzyzewski has been making since he returned from the other side of the pond. Amazingly, Coach was the first one in the Duke Basketball offices the day after he got back, which is a testament to his dedication and hard work. Here at BDN, we're still trying to figure out ways of saying thanks for all that he does. Meet the Devils goes off tomorrow at the Paschall Field House at around 6:00 PM. Paschal is the new facility in the end zone of Wallace Wade, and once you see it you will know that Duke Football is making the necessary moves to compete in the increasingly difficult ACC. This is a serious facility. Free posters, refreshments, drawings for prizes and such will take place. It's a great time to meet the football team in an "up close and personal" environment, and you'll be able to take pictures with your favorite players as well. Come on out if you can! Staying with the pigskin, check out this in-depth question and answer feature on the ACC Sports Journal web site, where BDN Football Analyst Patrick Cacchio chats with Jim Young about the Duke program and this year's team. Jim made no bones about putting Patrick on the hot seat, and our man predicts a 5-7 season against a pretty dern tough schedule, both in and out of conference. For instance, Duke has to face Florida State and Clemson from the other division, while UNC gets Maryland and Wake Forest. The pressure is already building for the opener against Florida International, who returns 18 starters from a season ago, when they went to the Beef O'Brady's Bowl. The Panthers dominate the Phil Steele Preview Magazine's All-Sun Belt pre-season team, with 10 players on first or second team. In last season's meeting down in Miami, the Panthers badly outgained Duke in total yardage, but the Blue Devils prevailed because they did not turn the ball over and they capitalized on FIU's only turnover to pull it out late by the score of 31-27. Undoubtedly seeking revenge, the Panthers will have their ears pinned back and be ready to rumble; in many circles FIU will be considered the favorite. It will be a heck of an early test for the Devils, and they'll need Wallace Wade to be packed and ready. Patrick also has an interview up where he recaps the latest Duke verbal commitment, California running back Joseph Ageigbe. This is verbal number fifteen for the program, which really does seem headed in the right direction. With all of that going on, Andrew Slater's latest interviews have been flying a bit under the radar at BDN Premium. Slater has set the gold standard when it comes to getting to know these hoops prospects. One recent post profiles The Rockwell Rifleman, Austin Grandstaff who is a young combo guard out of the Dallas area that we talked to at the Nike Peach Jam and then followed up with in Las Vegas. Then there's the Rebel with a Future, KavonLooney, a good-looking prospect from Milwaukee who has been catching the eyes of many scouts. There is also Explosive Potential-An interview with Robert Hubbs focussing on the Tennessee wing who continues his rise in the rankings, and finally the star wing out of Houston is profiled in And Justise for All-The Justise Winslow interview. As a paying subscriber you have full access to all of these articles and can talk recruiting and more on our members-only message board, where you will get all the latest scoop. BDN will cover today's closed session football scrimmage and we'll have photos galore. Be sure to check out the previous pictures from Photo Day here and we will be adding more as time allows. 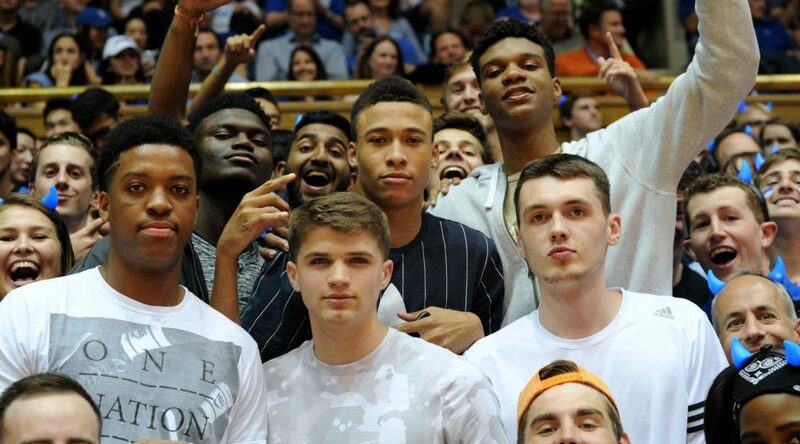 Duke Basketball Notebook – A busy month ahead! - The NBA Draft goes off this week and the Duke Blue Devils will have two players selected, Austin Rivers and Miles Plumlee. Rivers seems to be moving up as the draft nears, which is exactly what we told you would happen when he was initially projected to go around 17th in the first round. Rivers's transition to the NBA will likely be much easier than others' due to the guidance of his father, and perhaps NBA types are considering Doc's influence as well as the skills that Austin brings to the table. We are also going to honk our horn on Miles a bit, in that we let you know early on that the eldest Plumlee was impressing many with his measurements and skill set at pre-draft workouts. Now everybody is raving about Plumlee, and it could not be happening to a nicer kid. It also goes to show that playing less at a top flight program is sometimes better than playing a lot at a bad one. Miles wears his NCAA Championship ring with pride and we hope one day he has another ring to add to it. - Speaking of rings, Shane Battier added another one as the Miami Heat won the NBA title. Battier played a huge role, knocking down timely three point shots and making key steals, tips, and other heady plays to help seal victories. Shane is already benefitting from the hype. - In other NBA news, former Duke star Danny Ferry is the new General Manager of the Atlanta Hawks. Ferry has deep roots in the league through his father Bob Ferry, who was the long-time GM of the Washington franchise. - While the rosters have yet to be officially announced, the N.C. Pro-Am kicks off later this week, and as we have been since the event's inception, Blue Devil Nation will be there to report. This event provides some of the best basketball entertainment that can be found in the dog days of summer, and the price is right -- attendance is free. This year, they've cut back to eight teams and there will be three nights of action. We'll have more on the logistics and other particulars in the coming week. But regardless, we'll be in our customary spot in the end zone, so stop by and say hello. 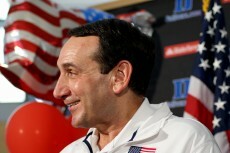 - The Duke Men's Basketball staff will head to Las Vegas shortly, and be gone through July 4th. Mike Krzyzewski is trying to bring another Olympic gold medal home from jolly old England this summer, and he'll have his trusty blokes, Chris Collins and Steve Wojciechowski, in tow. Several exhibition games have already been set, and we'll follow Team USA as we always have in the past, so be sure to bookmark the site for updates. 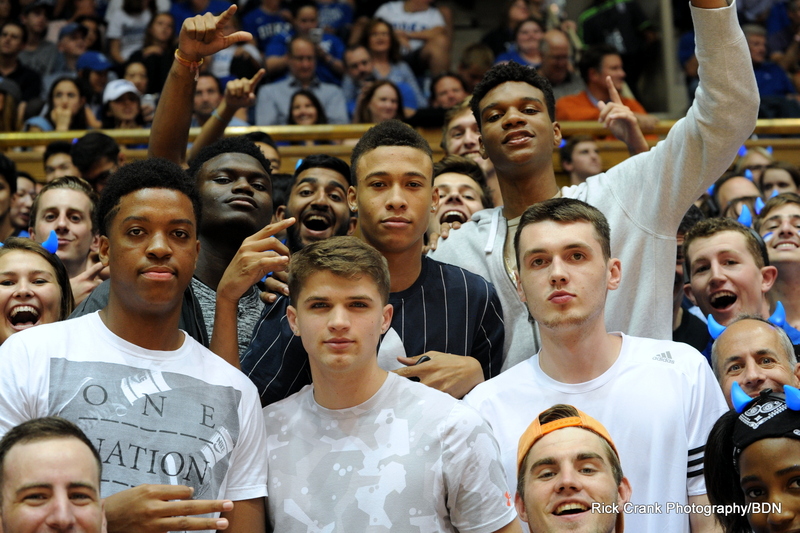 - During the coaches' absence, assistants Jeff Capel and Nate James will take center stage on the AAU circuit, so Duke will still be well represented at the great events remaining this summer, many of which BDN will cover. - Don't forget that Alex Murphy will be playing for the Finnish National Team this summer. He will earn a lot of burn, which can only help him in the coming season. We told you long ago that Alex would be suiting up for Finland, and here is a video from last March where he spoke of his redshirt season and playing for Finland. - Meanwhile, Mason Plumlee and Ryan Kelly are participating in the Amare Stoudemire Big Man Camp. If you were a BDN Premium member, you would have known about this weeks ago. Plumlee and Kelly will be seasoned senior leaders this season for Duke, and if history repeats itself, that should bode well. Having veteran leaders is big come March. - This is the week coveted transfer Rodney Hood will suppoosedly announce his decision. Hood is down to Duke and Ohio State, and I feel good about the Blue Devils' chances. As you may have learned in an interview BDN Premium had with Hood before his senior year in high school, he grew up a Duke fan, and some say that by Thursday we will know where the long and lean prospect will be balling for the remainder of his college career. Many leakers are saying he is bound for Columbus, but our suggestion is to take a wait-and-see approach. 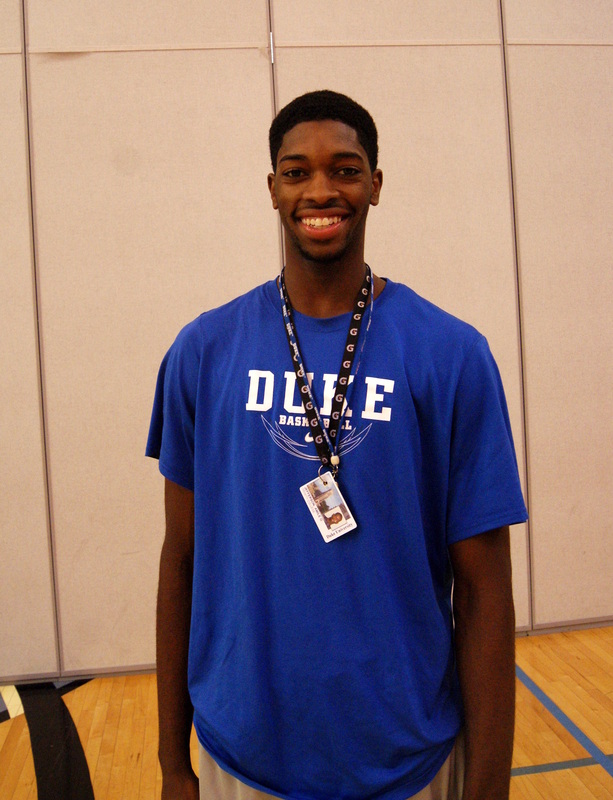 - For more on where other Duke players will be this summer, join BDN Premium. Speaking of our Premium service, our interviews continue to draw raves for their timeliness and their detail. Andrew Slater is doing a great job for us (as is the rest of our staff) and we invite you to join and discuss all the latest with fellow members. We have a lot of interviews coming soon, an early bird Duke hoops preview, as well as much more on the football recruiting trail, where Patrick Cacchio's work is second to none. If you are looking for a reliable source of timely information, BDN Premium is that place. In our latest offering, for example, recruiting insider Van Coleman takes a look at Duke and national prospects in an exclusive with BDN. BDN Premium features the nation's best talent scouts, from Tom Konchalski and Clark Francis to the aforementioned Coleman, to give our members the best information available from a variety of well known, tried and true sources.